THE BUSHFIRES in Gippsland and an unexpected Total Fire Ban may have put some people off, but those who congregated at Warrandyte Reserve for the ninth instalment on Run Warrandyte were not left hot and bothered. 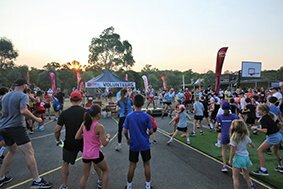 An expanded event village and an impressive array of businesses on the netball courts meant there was plenty for runners to see, do, buy, drink and chat about before the business of running commenced. For the second year in a row, runners would ascend the slopes of Everard Drive before taking to the trails in The Pound, which included — thanks to the generous support of Jan Day — a mad-dash through the grounds of her property between Pound Road and the riverside walking trail. 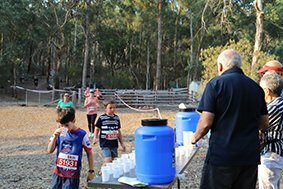 Although some were caught out by the heat, most managed to complete their chosen distance with a smile, and a one-litre drink bottle courtesy of Warrandyte Community Bank was well received. Johnny Kingma, a runner from the northeast suburbs who, the previous week, placed 6th in the 42km course at the Roller Coaster Run in the Dandenong Ranges. It is the first time that Johnny has run the course and he told the Diary how he was impressed at how scenic it is. 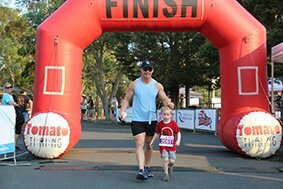 People of all ages, from all over Victoria came to Warrandyte to participate in our villages annual fun run and talk on the ground is that people were surprised by the course and thoroughly enjoyed it. With a smattering of attendance from local running clubs including Generation Run, Diamond Creek Runners, Westerfoldians and Victorian Ultra Runners, race organisers hope talk of the Run Warrandyte course will spread and that attendance will be up for next year. Of course, 2020 will be the 10th anniversary of the run, planning has already started on what should be another awesome instalment of Warrandyte’s most athletic event on the festival calendar.